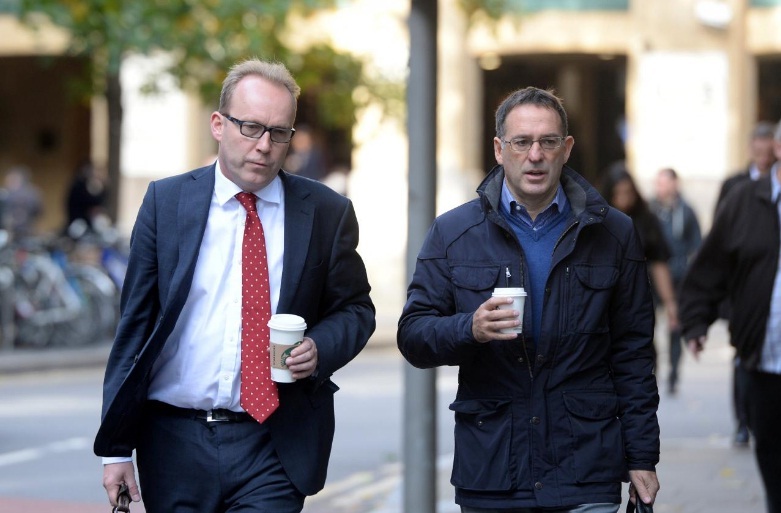 Former Tesco UK Managing Director Christopher Bush (R) arrives at Southwark Crown Court where he faces charges of fraud and false accounting in London, Britain, October 4, 2017. LONDON - The head of Tesco’s UK business was read out “almost word by word” a report detailing a 250 million pounds ($327 million) hole in the supermarket’s accounts in 2014 a week before the stock market was informed, a court heard on Friday. Amit Soni, a senior accountant at Tesco, was giving evidence for a third day at the trial of three former senior executives of Britain’s biggest retailer who are accused of fraud and false accounting in 2014. Christopher Bush, 51, who was managing director of Tesco UK, Carl Rogberg, 50, who was UK finance director, and John Scouler,49, who was UK food commercial director, all deny any wrongdoing and have pleaded not guilty. The case follows Tesco’s announcement in September 2014 that its profit forecast had been overstated mainly due to booking commercial deals with suppliers too early. Tesco’s disclosure saw its shares tumble and plunged the company into the worst crisis in its near 100-year history. The court had previously heard that Soni commissioned a detailed report, “the legacy paper”, which showed how around 250 million pounds of income had illegitimately been “pulled forward” in Tesco’s accounts. Soni told the court on Friday that he attended a Sept. 16 2014 meeting with Scouler and group commercial director Kevin Grace, with Bush also present via conference call. He said Scouler read out the paper. It was a “very detailed reading out...almost word by word,” he said. Lead prosecutor Sasha Wass asked Soni what Bush’s reaction was. “He (Bush) said to the effect that the legacy number read out will have to be discussed with Dave Lewis, the new CEO of the company. Equally there is a responsibility, a corporate responsibility, for everybody to hit the numbers and hit the budget,” Soni told the court. Lewis had replaced Philip Clarke as CEO on Sept. 1. Soni said he had expected to be informed when discussions would take place with Lewis but did not hear anything on either Sept. 17 or 18. The court has previously heard that later on Sept. 18 Soni visited Kay Majid of Tesco’s legal team and presented the report to her. Lewis then became aware of the report and he dealt with it as an emergency. After two board meetings on Sept. 21 a corrective statement was issued to the stock market on Sept. 22. Neither Lewis, Clarke or Grace face any charges. The trial is expected to last until Christmas. The head of Tesco’s UK business was read out “almost word by word” a report detailing a 250 million pounds ($327 million) hole in the supermarket’s accounts in 2014 a week before the stock market was informed, a court heard on Friday.